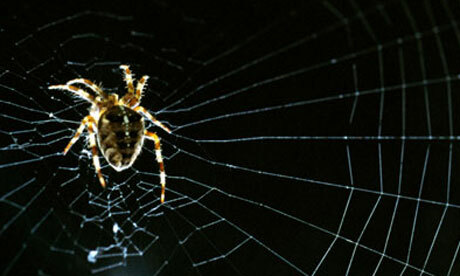 Spiders have played a key role in the history of astronomy. This is not simply in being creatures that have kept vigil with the nocturnal astronomer, who is inspired, Robert-the-Bruce-like, by their skill and tenacity, but something far more fundamental. Spider silk was sufficiently fine, sufficiently uniform and sufficiently strong to be used in the focus of a telescope’s eyepiece for precise measurement. Rather than cross-hairs, astronomers spoke of “wires”, against which the position of a star might be read. Several such spider-silk “wires” or “threads” might help time the transit of a star across the local meridian or, moveable, help measure the distance between binary stars. Looking the other day for something else, I was pleased to come acrossan 1894 article in the journal of the British Astronomical Association by one of the Royal Observatory’s assistants, E Walter Maunder, that was a how-to guide to “Making a Spider Line Reticule”. My headline is taken from Maunder, who refers to “Mrs Glasse“, whoseThe Art of Cookery was famously supposed to have instructed readers to “First catch your hare”. In the spirit of the best how-to and make-and-mend housewife, Maunder was sharing his knowledge as money-saving advice for those who could not afford a professionally made filar micrometer. That said, spiders were being caught and used by astronomers at Greenwich for years, and were to be until at least the 1950s. Unlike Mrs Glasse, Maunder had some hints on animal capture. The spider required was Epeira diadema, “the handsome coronetted spider of our gardens”, although “she has no astronomical monopoly” and an ordinary house spider might do. As he says, “The best time for a raid is the month of October” – until it recently turned cold I spotted many beautiful garden spiders with magnificent webs even in uninspiring urban front gardens. Next comes the crucial step, with the acquisition of a “fork”, aka “a piece of wire bent into the shape of a U”, about 12-15 inches long, with the two points about 3 inches apart; “of sufficient width, that is, to well overlap the frame to be webbed, so as to give enough tension to the webs to keep them straight”. The filled forks were to be placed vertically for about an hour, after which time it was possible to pack them away in boxes until required. Maunder’s article then carefully describes the process of fitting the threads to a frame, and fixing them at a proper tension with some more varnish – applied, he suggests, with another unlikely astronomical instrument: a knitting needle. Of such things – and sealing wax and string – are the most distinguished careers made. Absolutely amazing post, Becky! Loved it!